Description: The place where the Southwest Pennsylvania Railroad and CSX meet. Description: Seen at the Scottdale Train Station. Description: Seen at the Southwest Pennsyvlania Railroads home station in Scottdale, Pa. They must be kept constantly running in this weather, but I think they were in for the day. All three engines are GP-11s. Description: These engines are heading westbound using CSX track rights, on their way back to Scottdale after dropping off some empties. In the background you can see CSX 2777 getting some fuel from a tanker. #2002 is a former UP 708 GP7 built in 1953. Also SWP 2002 was used in the famous "Unstoppable" movie for the locomotive on the excursion train that barely avoided hitting the runaway train. Description: Here the train is climbing the grade up out of Owensdale, where the line junctions with a branch of the Wheeling and Lake Erie. From here it would shortly make it into Everson to meet SWP 2002. Description: A small mixed freight train seen leaving the Connellsville CSX yard westbound, headed back to Everson and Scottdale, Pa where this train would become part of a larger train. Earlier in this day there was a pedestrian-train accident almost in this very spot. Description: Two GP11s working hard and trying to pick up some speed for the grade a few miles away. Here it is about halfway between Broadford and Owensdale, bound for Everson. Description: The engines have just crossed the Jacobs Creek bridge separating Fayette and Wesmoreland County. After getting another section of railcars added on by SWP 2002, this train is off to Youngwood, Greensburg, etc. to deliver its loads. Description: Here the empty freight cars are getting dropped off at the CSX yard after the SWP came back from a trip to Mount Braddock, Uniontown, Smithfield, etc. After this the engines will go back to Scottdale and probably have lunch. Time is 11:54 A.M. Description: A train of empty freight cars cross the Greene Junction Bridge over the Youghiogheny River. It has come from the area of Mount Braddock, Uniontown, and Smithfield where it exchanged full freight cars for the empties. After this bridge the SWP interchanges back onto CSX, where the cars will be dropped at the Connellsville yard. This railroad line is formerly the B&O FM&P Subdivision. Description: These two engines get a rest today since three other GP11's were already out doing the day's work. I was told one of these is broken down but I am not sure which one it is. Description: Yes this was a planned meeting of these trains. SWP 2001 and 2003 have come from the direction of Connellsville with a short freight train and were waiting for SWP 2003 to attach to a string of covered hoppers and tank cars on another track. Then SWP 2001 and 2003 pulled up far enough past the switch on the track so that SWP 2001 could pull its train up on the same track, and then back the train into the other one, to form one long one. So at the end of this, SWP 2002 went back to Scottdale with no railroad cars. Description: Finally all three of the SWP red and yellow GP11's are together on one train. The Z687-29 freight local pauses in Broadford for a signal to get back onto SWP trackage. Then it's off to Everson where the freight cars will be staged. #2002 is a former UP 708 GP7 built in 1953. Also SWP 2002 was used in the famous "Unstoppable" movie for the locomotive on the excursion train that barely avoided hitting the runaway train. Description: A short freight local going west under the Sodem signals after picking up a few cars at the CSX yard. Description: A short freight local going east into Connellsville on CSX rails. The other two locomotives on the SWP roster were in the rear. 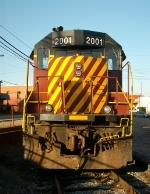 SWP 2001 was reconditioned and repainted the past summer at the National Railway Equipment shops in Dixmoor, Illinois. The EMD GP11 was built as IC 9333 GP9 in December 1957. NREX 8749 EMD GP11 was built as IC 9314 GP9 in December 1957. SWP now has ownership of it and a cranberry red and yellow paint job will be in its future. Description: Southwest Pennsylvania Railroad brings out its whole fleet of EMD GP11s on this freight train going east on Track 2 Main through the Connellsville CSX yard. At the other end of the yard it would switch off onto SWP tracks, cross the Youghiogheny River and serve its customers in the southern part of the county. The weather forecast for this day couldnt have been more wrong, as they called for mostly cloudy skies with a rain shower. Description: Three EMD GP11's from the Southwest Pennsylvania Railroad, running light into Connellsville to pick up five cars from the yard. A Sunday trip to Connellsville is almost a regular occurance for them now. Description: Two GP40-3's and two GP11's take their loaded train west on the CSX Keystone Sub after working the yard in Connellsville. Yes, the SWP 2006 was leading with the long hood forward. Made no sense to me. Description: Three EMD GP11s going west through Broadford, Pa with a freight train on Track 1 Main, using CSX trackage. The evening sunlight was about as good as it gets. Description: At the Church Hill Road Crossing in Dunbar, Pa. After picking up empties further south in the county, the train is now heading back to Connellsville. I didnt know ahead of time that these guys were out this way today. I was just in the right place at the right time. Description: Three EMD GP11s now running light after doing coal train duty for half the day. Seen crossing the small bridge over Jacobs Creek which separates Everson and Scottdale, Pa. They would go to their home station in Scottdale for lunch before continuing their work for the day. Isnt that water in the creek beautiful? I blame that on the hot weather. Taken from the Scottdale-Everson Bridge. Description: An EMD GP11 trio brings up the rear of a 40-car coal train being moved from Everson to Owensdale, Pa. They would cut off from the train in Owensdale and then come back to the station for lunch in Scottdale. Taken from the Scottdale-Everson Bridge. Description: Three of the four total GP11's owned by the Southwest Pennsylvania Railroad are working the east end of the CSX yard on an already hot and sticky morning. These guys work fast and get it done. Usually they are in and out in less than half an hour. Description: The Southwest Pennsylvania Railroad has finished its work in the Connellsville CSX yard but now is being held here because of multiple trains to the west. Description: The Southwest Pennsylvania Railroad is here in Lemont Furnace, Pa to pick up seven flatcars of Bradley M2 infantry fighting vehicles that have been refurbished at BAE Systems Land & Armaments, LP. The crew for the train has run out of hours and got taken back to Scottdale, Pa. These engines are facing north and will be the lead engines when the train leaves again. SWP 2006 was on the rear. Photographed with permission. Update: This local BAE facility has now gone out of business at the end of 2013. Description: Going west through Broadford on Track 1, running as train number Z687-12 since it is using the CSX Keystone Subdivision. Description: A pair of GP11's cross over Broadford Road in Broadford, Pa, taking a train of 11 flatcars carrying Bradley M2 armored vehicles (with 3 buffer cars). One more crossing to go and then its onto CSX rails as train Z685-17. SWP 2001 GP11was built as IC 9333 in December 1957. SWP 2003 GP11 is a former JTPX 1801, IC 8705, ICG 8705, MBTA 7555, CR 7555, PC 7555, NH 1225. Built in August 1956. Description: A train with 11 flatcars carrying Bradley M2 armored vehicles has momentarily stopped at the signal just before one of several crossings of Broadford Road in Broadford, Pa. It is facing south here, and is less than half a mile away from the interchange with CSX where it will go east with the train number Z685-17. This rebuilt GP11 was built as IC 9333 in December 1957. Description: SWP train Z685-11 waiting in the Connellsville CSX Yard for some switches to be thrown ahead of it so that it can make its movements. Description: Train Z685-11 makes its way west out of the Connellsville CSX Yard to drop off some empties it picked up on the ex-B&O Sheepskin Branch. Description: Proceeding through Broadford with a short train of empty sand cars, past an old weathered barn. Description: Rounding the bend after just crossing over Broadford Road. Another crossing lies not far ahead. The weather was still beautiful at this point but that would change later in the day. Description: A trio of GP11's going over Jacobs Creek between Fayette and Westmoreland counties. They have just come back from Connellsville and dropped off their railcars in Owensdale and Everson. Description: Train Z687-14 going west on Track 105 in the Connellsville CSX yard. Where the crew vans are parked used to be the tracks for the turntable. Description: A train of sand hoppers takes it slow on the slippery snow covered rails, approaching the crossing at Lemont Furnace, PA. Description: Train Z685-12 pulling hard on CSX rails, on a very winter-like November morning. This train was headed to the SWP Sheepskin Branch to the south and did not stop and work the yard. Description: Heading home for New Year's Eve. The shorline SWP has completed its work over in Connellsville and is now crossing Jacobs Creek between Everson and Scottdale on a bitter cold afternoon. Description: Train Z685-03 is ready to go west out of the Connellsville CSX yard on a 14 degree morning. Seeing the SWP railroad operate is always like a trip back into the past with these rebuilt GP11 engines in their original GP9 bodies. All were built in the mid-50's and are still going strong. Description: Train Z685-03 shivers on the western end of the Connellsville CSX yard, with quadruple GP11's. Description: Today the SWP Railroad has lost the battle with winter and is forced to shove their train backwards off the ex-B&O Sheepskin Branch because of snow that was over a foot high. Here it is passing underneath the former Western Maryland Bowest Bridge in Wheeler Bottom. Description: A mix of GP11's and GP40-3's that makes up the entire SWP roster is on this 83 car monster of a train. At the time it was the most cars I have ever seen the shortline SWP handle. They were all empty sand hoppers. Seen going west on the CSX Keystone Sub. Description: Empty sand train going west under the Sodem signals on a blustery March day. Description: SWP 2003 and CSX 6512 momentarily pause next to one another while they are both working in the Connellsville CSX Yard. The SWP train quickly dropped off a few empty sand cars and they were on their way again. Description: Three EMD GP11s power this Southwest Pennsylvania Railroad freight train north on the former B&O Sheepskin Branch on April, 16, 2014. On the left you see the cleared trees for the recently reclaimed Bowest Yard in Dunbar, PA. Closed by the Western Maryland Railway in the 1970's, the yard and facilities were removed except for a few overgrown tracks. A booming Marcellus Shale natural gas industry in the region persuaded the SWP Railroad to invest in reconstructing Bowest Yard, which will allow them to store more freight cars and give quick access to nearby CSX. Also, on the right side the trees have been cleared for a second track to run from Wheeler to Mount Braddock, PA. The past is truly reliving itself, as this section was double-tracked in the days of the B&O. Description: SWP 2001, 2006, and 4005 are shoving and pulling on this heavy 96 car sand train. Even with six engines on the train, it still struggled on certain grades and slowed to about 5 mph. Description: Heading north through Bowest after a new morning crew picked up their engines in Mount Braddock and worked the sidings in that area. A new siding is expected to be put in on the right side but it is starting to grow up again in the meantime. Description: A set of three engines on the rear of an empty sand train in Bowest, Dunbar PA. I would call them helpers but that is not the word to use because they were only going to be pulled along by the train, rather than help push the empty train. Description: A trio of GP11's coming into town to pick up some cars from the CSX Yard. Description: Two GP11s returning back from the Menasha Packaging Company with two boxcars. They are running long hood forward. This small bridge over Buttermore Road has many identifiable details from the former Pennsylvania Railroad. The stonework, concrete deck, and rusty steel handrails. Description: At the bridge street crossing, a pair of GP11s have three boxcars that need to be delivered to Menasha. They are going to go down the 3-mile Yukon Branch, with the switch being just beyond the crossing. The conductor would get on the end of the last boxcar to lead the way.